Google is going after local businesses in a big way. It is promoting Google Places any time someone does a local search, it tried to buy Groupon for $6 billion, and it put star exec Marissa Mayer in charge of local products. Since the middle of December, it’s been running a $100 million marketing promotion aimed at small and medium-sized businesses to try to get them to sign up for AdWords. 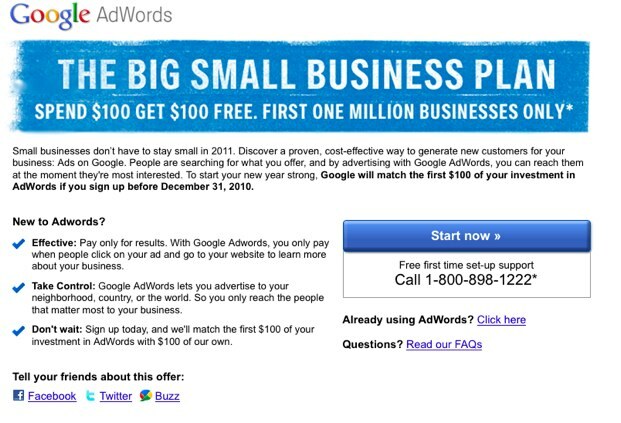 Small businesses that sign up by December 31 have until mid-February to spend $100 on AdWords, after which they will be given another $100 credit. The promotion is good for “the first one million businesses only.” If one million businesses sign up and spend that $100 the total value of the campaign will be $100 million. Of course, the campaign won’t really cost Google anything. It is spending $100 to acquire these small local business as new customers. It has offered similar promotions in the past. But Google’s efforts go beyond offering these credits. What we’re seeing at Google is a significant commitment to the local market and a related internal cultural shift. Google needs to find its next leg of growth and local (which is intimately tied with mobile) is where it is putting a lot of its fire power.